This ecologically pioneering, year round vacation house is nestled in the sand dunes of the barrier beach. The profile of the house follows the natural forms of the dunes and accommodates an array of climatically responsive strategies. 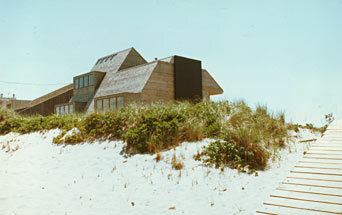 The exterior cedar walls blend into the beach palette. The sloping north wall reduces winter heat loss; the south façade provides glass walls for passive solar heating, active solar collectors for water and swimming pool heating and overhangs for summer shading. An innovative thermal draft-inducer ventilates and cools the house naturally. All human and organic waste is collected in an anaerobic composting system and recycled as fertilizer for the eroding dune grasses.